I could say this top/dress pattern has been 20 years in the making. The top is inspired by my Senior prom dress, and my first design. 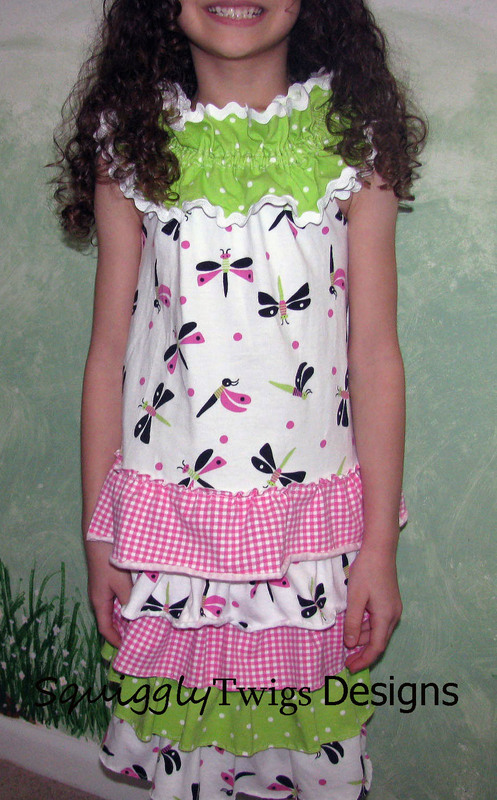 Since ruffles are making a huge come back in fashion, especially children's fashion, I've been anxiously waiting Spring to come so I could share this design with you. The Miss Leila is the perfect top or dress for Spring and Summer. The elasticized ruffle around the top make an easy fit and adds extra pizazz. The ruffle can be any width you'd like, and your elastic can run through the middle (like our's) or be off set. 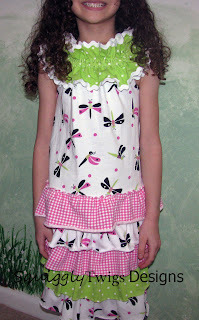 The body of the top/dress is made from one pattern piece with the length customized by you with two simple measurements. We used knit fabrics for our top, but the pattern will work wonderfully with woven fabrics as well. Since my girl is a ruffle loving type, we added a ruffle at the hemline to coordinate with the ruffle skirt shown with the top. You could also add a pair of bloomers for your little one, or pair it with the Cute and Quick Pants or capris, also designed by SquigglyTwigs to change it up a bit.